Conor Dunne was in the saddle today for just over seven hours and has shared his data for his Milan-Sanremo ride. You can also view the fastest rides up the Poggio from today and all time. 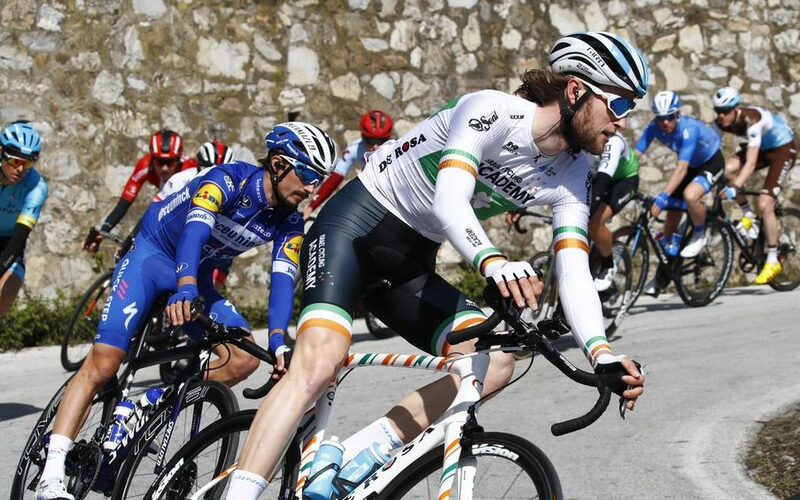 It was great to see Irish road race champ Conor Dunne wearing his champion’s livery in Milan-Sanremo today, and also good to see him share his data afterwards. The Israel Cycling Academy rider completed the race in 135th and was just over ten minutes down; 10:35 off the winner to be precise. When Dunne shared his Strava data, his moving time was some 19 minutes longer than his race time of 6hrs 50mins 32secs. While he was some way off winner Julian Alaphilippe (Deceuninck-QuickStep), there were plenty of men behind Conor Dunne, 40 to be precise. And the last three riders over the line were 20:53 down on the French winner, who sprinted in at the front of an 11-man breakaway. The winning escape went clear on the upper slopes of the Poggio and across the time of the climb, just before the drop down into the finish. 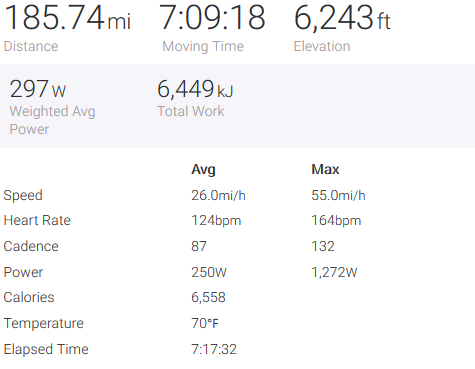 Conor Dunne’s weighted average power for his 185.74 miles – or 298.92km – was 297 Watts. His total work was 6,449kj. Dunne’s average speed for that kind of mileage was a staggering 26 miles per hour and his max speed was 55 miles per hour. Listed as 88kg, his average power was 250 watts and his maximum power was 1,272 watts, burning 6,558 calories as he went. However, because his moving time was much longer than his race time, all of these numbers are slightly lower than what they would have been had he only recorded his race time. His numbers are averaged out over his race and the additional 19 minutes that he was moving but not racing. We’ve also compiled the top 20 fastest times up the Poggio today posted on Strava and the top 25 fastest times of all time for the climb posted on Strava. Michal Kwiatkowski (Team Sky) climbed the ascent in 5mins 41secs today, the fastest ever time posted on Strava and shared publicly. You can view the full list of today’s fastest times by following this link. View full all-time list by following this link.